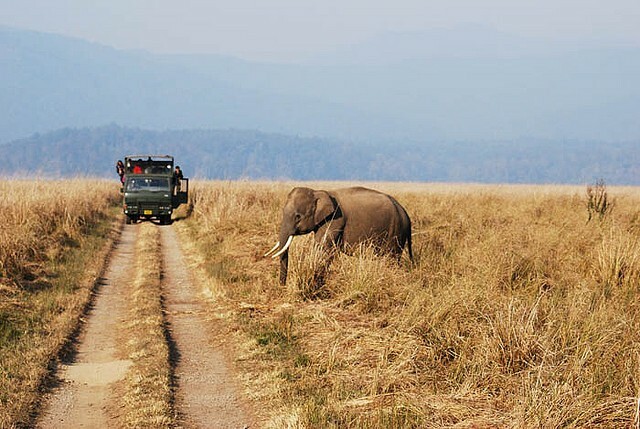 With the reopening of the widely famed Corbett National Park on the 15th of October after a four-month monsoon break, wildlife enthusiasts have started thronging the park in huge number. With the intent of watching wild tigers roaming in the open air as well as several other exotic species of birds and animals, tourists have started booking resorts and lodges located nearby in advance. For the convenience of tourists, as of now only Bijrani Zone is opened to the public while Dhikala will be opened on the 15th of November. Due to heavy rainfall every year the park remains closed from mid June to mid October. It is only the Jhirna zone that remains open round the year. Jim Corbett National Park is a world famous reserve forest which was set for the protection of the endangered tiger population. The park is mainly divided into four different zones known as Dhikala, Bijrani, Durga Devi and Jhirna which bring excellent opportunity of getting closer to the exotic flora and fauna. Dense forest is mostly interspersed with valuable plants and serves as an ideal habitat to a number of endemic species of animals roaming in free air. For tourists who are enthusiast enough and love to experiment with their staying options can choose their pick from a limited number of night stay resorts built inside the park. Jeep safari is available for the tourists in specific zones and time. Jungle safari is a wonderful option to know this protected area closely.